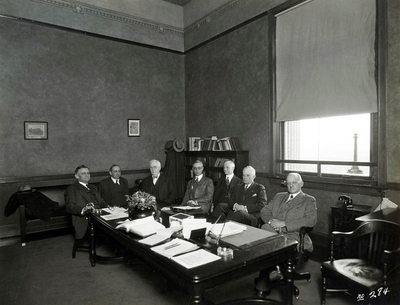 This is a photograph of a Board of Regents meeting with architect Brinton B. Davis in Van Meter Hall. Seated left to right are W.C. Bell, Charles Nahm, Morgan Hughes, Sterrett Cuthbertson, Davis, Max Harlin and Henry Cherry. Cherry chose Davis as the college architect in 1909 and he designed eleven of the campus buildings from Van Meter Hall to Cherry Hall. He has been referred to as the Hill Builder.